Drastic times call for drastic measures, no? Maybe jefbot’s solution is a little too drastic, at least for cel, but it might’ve worked. I suppose jefbot could’ve pitched the idea to her more effectively, though. Maybe next time. Happy 2011, all! I’m feeling very optimistic about this year and I hope you’re feeling it, too. And hey: it’s my sister Laura’s (aka Lor) birthday today! Happy birthday, sis! Lol! Yes, flashing is very effective as a distraction tool…as I’ve discovered for myself. *cough cough* And happy birthday to Laura! thanks for the birthday shout-out to Laura – i’ll be sure and pass it along if she doesn’t see it here. yep, cel’s got a decent punch, and just so you know – she held back! heheh. Yay! Shades of Firsting! *dons them and checks reflection in a mirror* Niiice. Well, good for Cel, then…knocking out your champion tends to end poorly. But she’s got great self-control to pull her punch when she’s that annoyed! Meh, looks like a wimpy punch. Wimpy. I think that cel should have been able to knock Jefbot off of his feet, at the least, in my own humble opinion. I mean, she looks like a girl who would either have studied Tai Chi, or Krav Maga. cel totally could’ve knocked bot on his feet had she wanted to, Bl4ckw0lf! i mean, just look what she did to Corn & bot’s door. this was more a playful “tap” compared to what she’s capable of. I agree. Every woman should be willing to expose herself for the greater good. What system do you play Dragon Age on? I don’t have Dragon Age, but…. In case you couldn’t tell, I’m G-Man0091….. But I won’t be home for a while. I live in England, but I’m flying to the U.S. for the Summer on Saturday. XBOX 360. i just pre-ordered DA:II to get the Signature Edition, so i should probably get to finishing DA:O before the sequel comes out in march. Heh, yes, that *would* help…though I’m told DA:O and DA2 don’t necessarily rely on each other. Which bums me out a little, but I can’t wait to see what DA2 looks like. 🙂 Should be pretty! Thanks for the happy birthday wish. Hope you have a rockin’ 2011. I’m sure it’s just a coincidence, but on the right-hand side of the page at the moment, there’s an ad for a website called Stuff in Cleavage. I stuff things in there all the time. You should see when I have my corset on…I look like a Magician pullin stuff out of a hat. And still look FABULOUS! “nature’s pocket” = ha! and i’m sure you pullin’ stuff out of your corset has the guys more mesmerized than any magic trick you could perform. Yep, you got it. You should go back and start reading the strip from the beginning. It’s fun to watch the storylines and Jeffs drawing evolve. thanks for answering supersonic cucumber’s question, shanna! yep, Tiana was lightning fast today, supersonic cucumber! and double yep: paf! be afraid if cel ever truly unleashes the true potential of her fist! how about dropping pinky’s brother DOWN a elevator shaft? 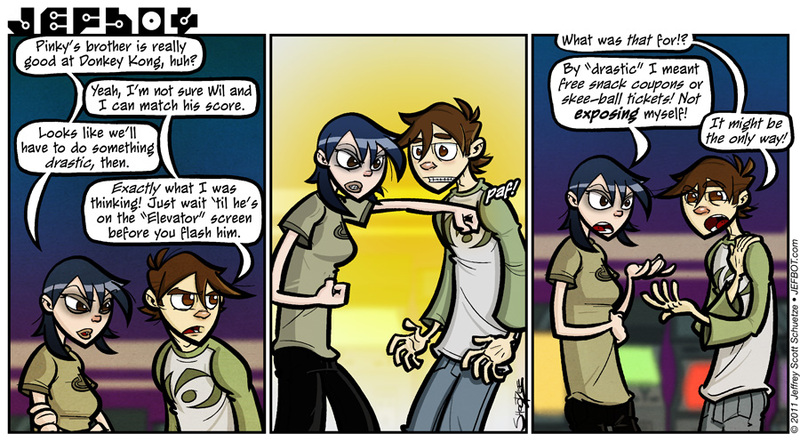 I’m not sure flashing would work on a dedicated gamer . . . then again, I’m female and might not have a total grasp of the Y-chromosonal POV. But if ‘bot kissed Pinkys cheek, she’d be toast. Then again, so would ‘bot, after Cel got done with him. Ah memories! When I was in grad school, a friend and I decided to play “distraction darts” with some guys in school with us. Every time they were up, we’d sneak up behind them and blow in their ears. 🙂 I was decent at darts, but that evened the playing field even more. loloz..thats bad manner on your part JB. Thank goodness Cel only punched u in the shoulder region. yeah, sometimes jefbot’s “appropriate” sensor isn’t working properly, JF#300. and “thank goodness” is right for cel not targeting an area more…. uh, “delicate,” so to speak. heheh. the DK Battle would’ve been over. admittedly not the smoothest way to start things off with a new girlfriend. Ha ha ha Good one. Thanks for the early morning laugh. Yes, that would have worked well, I bet. But cel doesn’t seem to be THAT much of an altruist. I wouldn’t have done it either in her place. These babies aren’t for public display, even when Donkey Kong is on the line! Happy birthday Lor! I hope it’s a good one. Thanks! It’s starting out to be a good one. Have an awesome 2011. Is Jefbot seriously telling his hopefully girlfriend to flash somebody else? …Cel should have punch him harder. you’re right; she should’ve punched him harder. This literally made me LOL! To distract the long haired hippy boy Cel doesn’t even have to get near him. All she has to do is give him a wink, a coy little smile, bite the lip a bit, giggle and glance away. It works, I promise. Girls don’t always have to be so “IN YOUR FACE!!!! !” to get a point across. As C.H.I.C. in my organization, I sometimes have to teach the girls the fine art of being girlie. And as far as that punch, that SO was not a punch that was a love tap. We’ve seen cel knock JB on his behind and give him a black eye. (Refer to the Archives.) So that was a “Stop being a pervy dumba$$” tap. Gamer boys are still BOYS (Males, whatever) and are instantly distracted by boobies. As a Geek Girl, I can attest to this fact. Last, but never least, HAPPY NATAL ESCAPE DAY LOR!!!!!! Damn I gotta cut back on the coffee! The things you post always make me smile. You definitely have a way with words. Thanks for the happy birthday wish. I wish you best in 2011.
and jefbot totally should’ve suggested one or all of those things you mentioned before going with the all-in “flashing” plan. he definitely has a lot to learn. and as far as “gamer boy geekiness” goes: when i first read your birthday wish to Lor, i read “Natal” as the codename for the XBOX’s Kinect motion-sensor doohickey and was like, did a new game come out for it!? having it be a birthday shout-out was much better. LOL! Oh Jeff…I cherish you so! How to start the New Year off, with an IdioBot moment. Ick. I’d’ve slugged him harder. And maybe even Bots manly gamer abs would work on Pinky. thanks, Eddie! happy you enjoyed it! and yep, you’re right about a gamer’s concentration – the world can be falling apart around me, but if i’m playing something like Geometry Wars that requires my full attention, i won’t even notice. of course, if random girls were flashing me outside the window, it might be a different story, but the point is made. Late congratulations on 300, Jeff! Keep up the good work! Nice thinking, Cell. Injure the man who HAS TO WIN the Donkey Kong challange. Reeeeal smart. Happy B-Day Laura. I hope it will be an awesome year for you and Mike and may there be many, many more. God bless. Thanks. Mike and I wish you an awesome year, too. Do lots of awesome things! thanks for the “Bahahas” TCG! pffft free snack coupons and skee ball tickets? What are they 8? Indecent exposure is a sure fire way.I don’t find it degrading to women. I think its takes a strong confident woman to expose herself. Plus if she’s willing to do that she must be adventurous in the sack. I say this cause I hang out with a burlesque troupe and they are fun but no non sense ladies. So if Cel won’t show her tatas I recommend using some female sexual guile. I finished bioschock 2 people; my review is in comic 300’s comments. On another subject what are your guys thoughts on ABC’s “the cape ” series premiering on Sunday? Personally for me it reminds me too much at the cheezy super hero series we had in the 90s ( FLASH,NIGHTMAN,and MANTIS). I loved those series growing up but none ever lasted beyond 2-3 seasons. With the exception of Lois and Clark which I hated cause I wanted to see superman beat someone not be all lovey dovey. i read your Bioshock 2 review: cool! will probably pick it up when i get through a couple games in my pile. i’ve heard that the “Minerva’s Den” DLC is awesome, picking up Giant Bomb’s Best DLC of 2010 award. you might want to check it out. not sure what i think of “The Cape” yet. i read some of the script and it seemed pretty good, but when i saw the commercials i thought the same as you: looks cheesy. i still might give the first couple episodes a try, though. gotta be better than No Ordinary Family, right? Wow… he’s really not too good with women, is he? Ha! ‘Bot has ONLY kissed Cel, and he’s offering her up on a slab like he owns her?! Bad, ‘bot! BAAAD! Yeah, I guess so. But, still, BAAAAAD ‘Bot! She can’t punch him harder than that? And what is this. She’s a gamer, he’s a gamer. She was supposed to have punched him either in the face or the gut. Everyone knows that a gamer is not supposed to punch another gamer in their most valuable resources. Nerve bundles. However, the bundle may be on the other side of the shoulder. Nevertheless, injuring the arm may have either profound dire circumstances, or may be the ticket that they need. If it’s the ticket that they need, then, well. Leave it to the Cornfather for the movie deux et machina. as for whether the Cornfather has a deus ex machina role to play in all this remains to be seen. looks like Wil and bot need something to save their butts! yes, flashing’s always a good option, Funnyshaffer! or is that never a good option? oh well, whatever. I think that’s an overreaction, it’s not THAT drastic! Dude, I want to see Bots skillful hands draw Cels cleavage as much as the next guy, but I still think it was more of a underreaction, than overreaction. I would say that that remark deserves at least a nice high velocity slap if nothing else, but I guess Cel just likes the poor nerd too much for that. cel does like that poor nerd too much for that, Eddie! plus, she’s already given him a black eye, so he kinda has credit. heheh. We already know he’s a perv. So he deserved to be punished. Hey! Stop volunteering the Harem members for stuff. BAD Mancub BAD! No Biscuit! I agree with red. Harem should help *distract* the Pinky bro. I’ll get the popcorn and lawn chairs. glad you share the same sensibilities as jefbot, Red! i mean, it’s a logical conclusion, right? *gives Eddie some tinfoil and a banana* If you can’t beat them…Join them? and what are you doing with said banana and tinfoil? Is it allowed in most states?? and do we want video of it?? i’m just gonna sit here with Maryz, Pixie and Will B, pop a Dr. Pepper, and watch Eddie’s antics from afar. Whenever I flash someone, it’s with my camera. All fear the blinding light of me! Being serious now, awesome strip and I imagine that more than a few people would have liked for Cel to flash him. Cel’s probably not forget that Jefbot even suggested that for a while. my camera’s flashed more people than i have, that’s for sure, Fijiman. heheh. glad you liked the strip! ha! that’s a good headspace to be in, dj! This sounds just like a conversation I might have with my boyfriend. Very cute! thanks, Spaarfor! but tell me: do these conversations with your bf ever end with a playful slug to the arm? HAPPY NATAL ESCAPE DAY to ESQ! Today (January 5th, 2011) is Evil Mummy’s Birthday! Hope you have an absolutely amazing day! *pokes Dork King* Psssst, do something UBER nice! Yep, Happy Birthday to ESQ! Make yourself some coquitos and have a blast! Happy birthday, ESQ! Hope it’s awesome! Well done strip. So why is Cel surprised bot suggested that?? She the one who got him in that frame of mind by making out with him. Lol. See it all her fault. maybe but still would have been able to play. Granted it hard to play with black eye but still would have been able to play. before anyone calls me a pervert, the comic gave me the idea. I know how I’d feel. like my pants were too tight. Ha! Bot’s getting a little blue. I love it. Great work, bot. This strip is hysterical. Way to knock it outta the park with this one. …but, um, is Cell going to show her naughty parts in the next strip? I’m just asking…not that I wanna see, mind you. I’m just wondering in terms of your artistic sensibilities. In other words, WE WANNA SEE SOME T*TTIES!! Her back will be turned to us. Come on man!